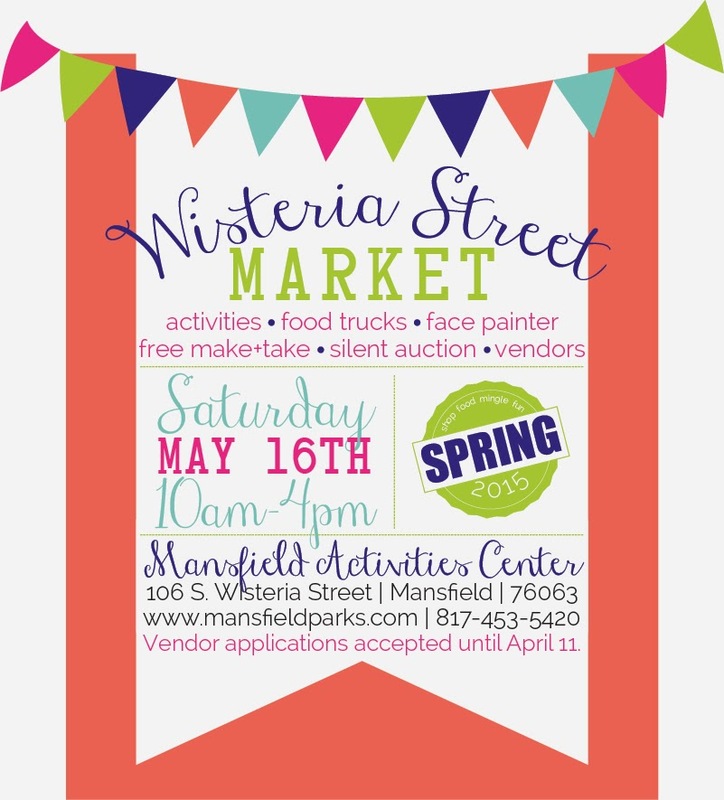 "Get ready for spring at the Wisteria Street Market! The Market will be held on Saturday, May 16th from 10am-4pm. We will have vendors, a silent auction, bounce house, food trucks, free make + take crafts, and more. Get the perfect gift for dads, grads, brides, or anyone else on your list at the Wisteria Street Market in Mansfield. We hope to see you around! Shop. Food. Mingle. Fun." "Come shop at over 60 booths featuring clothes, handmade crafts, wooden crafts, jewelry, candles, faith gear, accessories, quilts, crocheted items, healthcare products, kitchen items and much more. ADMISSION IS FREE!" "Bray Elementary of Cedar Hill hosts an annual Carnival, the largest single event of the Bray school year. Proceeds support school functions, including the school’s art program, which is solely supported by the PTA. This year, we are expecting more than 500 children and adults from throughout Southwest Dallas County. Although the carnival is a longtime Bray tradition—with games, live and silent auctions, bounce houses, dunk tank, raffle and many other activities and arts/crafts vendors. The event is publicized through local media, the school PTA web site and Facebook, Nextdoor Highlands North, signs, fliers and word of mouth from students and parents." "Join local small businesses as we celebrate our clients and their families! Taking place at the highly recognized Frisco Commons Park, your family is sure to enjoy a day of hot dogs, hamburgers, Fun DJ, playgrounds, nature trails, splash pad and more!" "A new fly-in and craft beer festival is coming to the Metroplex at the Fort Worth Aviation Museum. Our plans are progressing for a first ever fly-in and craft beer festival here in the Metroplex and it will all happen at Meacham Airport at our museum. Saturday, May 16th will be a free Open House at the museum to view the fly-in aircraft close up. The theme for this year's fly-in is 'Commemorating Operation Frequent Wind,' that marked the end of the Vietnam War. We are inviting Marine helicopter units to join us as well as a variety of civilian warbirds to commemorate the 40th anniversary of this action. In the afternoon, The Hops and Props Craft Beer Festival will run from 1 PM to 5 PM. Beer tasting from brewers in the area will be available for a fee. We will also have live music, family friendly vendors and other attractions. In addition, for a truly unique experience, we will be offering beer tasting flights. Through special arrangements with The Flagship Detroit Foundation and Greatest Generation Aircraft, we will be offering 30 minute beer tasting flights on a vintage DC-3 airliner, the 'Flagship Detroit' and a classic C-47 transport aircraft, the 'Southern Cross.'" "Old West Renaissance! Think of the fairs of the late 1800s, Family friendly, lots to see and do, all the wonderful Fair foods, drawing out the whole community. So far, we have an antique car show, ten chuckwagons, five Native American Tribes, a Ranch Rodeo, a Bacon Cookoff, Pie Baking contest and a free kids zone." "This is a Craft Fair and Vendor Benefit to help Raise Money for Brooke Foster. Brooke is a 16 year old young lady who is suffering from stage 4 Osteosarcoma which is a form of Cancer. " "Legacy Preparatory Charter Academy (LPCA) will be having our 2nd Annual Health Fair and Flea Market Bonanza! This will be a one day family event, including free health screenings; flea market; food concessions; slides and other fun exciting attractions!" Admission Fee: Games and concessions available. Bracelets entitle children to participate in games, slides and bounce houses. Cost per bracelet onsite is $5.00. Presale through the school is $3.00. "Back for a second year, the Taste of Irving is a free, outdoor festival featuring family-friendly activities and food from Irving restaurants. Attendees will enjoy live music on the Valley Ranch Association Main Stage, a free fun zone with rides and attractions for children, chef demonstrations and a large craft marketplace featuring jewelry, décor, clothing and more. The highlight of the event are the food samples; each restaurant sells a variety of items from their menu for $5 or less! Last year approximately 5,000 people enjoyed the food, music and fun. Parking and admission are free; be a part of the action this year and join us!"